Would-be buyers are looking, but not yet buying, surveys suggest. 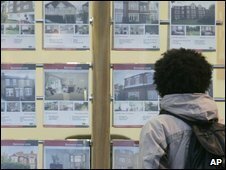 The average price of UK homes rose by 1.9% in January from December's figure, according to the Halifax. However it warned that one month's figures did not indicate an end to the downward trend in prices, which it says have dropped 17.2% in the past year. The average house price has now reached £163,966, according to the Halifax. Last week, a survey by Nationwide suggested house prices fell by 1.3% in January, and they said job worries were putting off people buying homes. Martin Ellis, chief economist at the Halifax, said his bank's latest survey did not mean the property market had reached a turning point, after last year's dramatic slump in mortgage lending, completed sales and prices. "It's far too early to make any conclusion," he said. "The figures are going against the trend and our survey shows that if you compare the last three months to the previous three [months] then prices are still down significantly, by about 5%," he added. Market experts are still agreed that prices will keep falling this year, probably until the economy stops shrinking, with continued restrictions on credit reducing the number of people taking out mortgages. However earlier this month, the Bank of England reported that the number of new mortgages approved for home buyers had picked up slightly in December. The 31,000 mortgage approvals were up from 27,000 in November, though they were still the second lowest figure on record. Estate agents have also been reporting more would-be homebuyers registering with them, though so far these have not yet been converted into a consistent rise in sales. "The Halifax report is consistent with the recent modest rise in activity as shown in our own surveys," said Brigid O'Leary, a senior economist at the Royal Institution of Chartered Surveyors (Rics). The Bank of England has been cutting the base rate sharply in recent months in an effort to stave off recession. It trimmed the rate further on Thursday, from 1.5% to 1%. One explanation for the Halifax survey recording a rise in prices in January, while the Nationwide reported a fall, is that they cover different time periods as well as just their own lending activity. "We report prices for the full calendar month, while the Nationwide reports sales from the 20th of one month to the 20th of the next, so they may have include some sales that took place at the end of December," Mr Ellis explained. When simply comparing the average price in January with the average price a year ago, the Halifax survey suggests that prices are down by 16.8% from £197,243 in January 2008. But the lender prefers to compare the average price for the past three months with the average price for the same period a year ago, which produces its current estimate of a 17.2% annual fall. All Halifax's house price data is based on mortgage approvals. Do you have a question about business and finance that you want answered? In an ongoing series, the BBC Business and Economics team want to hear from you.